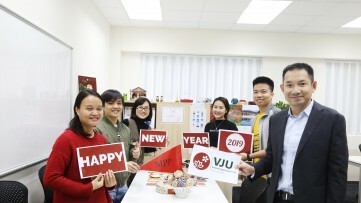 On 23 February 2019, VJU hold the Open Campus 2019 for Vietnamese students and students from all around the world to take a visit the real academic environment and learning about lots of scholarship, internship, studying abroad,… information which shall be offered when becoming VJU students. At the opening ceremony, the Rector of VJU, Prof. Futura Motoo welcomed all the students attending the event with a story of how he came to Vietnam and appointed to be the first rector of VJU. For the first and foremost moment of their experience at VJU, they knew about one of the most beautiful story about the origin of VJU establishment, narrated by himself. "The first time I came to Hanoi was December 1974. After that, I visited again in 1977 and 1980, specifically to teach Japanese at Foreign Trade University. After that time, I became lecturer of the University of Tokyo. I tried to promote academia collaboration between Japan and Vietnam. I soon established relationship with the University of Hanoi, later as Vietnam National University, Hanoi (VNUHN). In 1994, I had an opportunity to meet with the late Professor Nguyen Van Dao, the first President of VNUHN at the time. The meeting left so much emotions in me being just a young associate professor. During the meeting, the late Professor Nguyen Van Dao asked for my efforts in strengthening VNUHN’s position at the international level. Since then, I always consider his request as my sacred mission and I truly wish to become a small bridge to connect VNUHN and University of Tokyo and other universities in Japan. Prof. Furuta is a Vietnamologist. He has been studying Vietnamese since 1972. Already more than 40 years that has has studied and used Vietnamese. He does research on Vietnam’s pre-modern history in the Vietnam War era. According to him, when he was studying in university, the Vietnam War, which is more familiar to you as the Resistance War against America, broke out and Vietnam became the central of the international political platform. At that time, he thought Vietnam is the nexus of the world. If he studied Vietnam, he would be able to understand the world easier. That reason has lead Prof. Furuta to Vietnam and destined a large part of his life to Vietnam. At the event, students were brought on a tour of VJU campus. During the tour, they were experienced life within VJU such as learning and research activities. The tour of laboratories were one of the most excited for students where they were shown how the technical equipment was applied to derive answers to research questions such as the structure of molecules and how this helps in studies. Through short seminars on academic introduction, students raised so many questions about the program structures and scholarships and internships. Many professors from Vietnam and Japan of VJU had a conversation in person with students to help them out with their questions. A lecturer of Master's Program in Nanotechnology (MNT) showed students about mechanical equipments in MNT laboratoty. 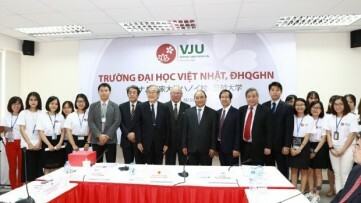 In 2019 academic year, Japanese and Vietnamese government continue to support 80% of tuition fee for all students enrolled in master's programs of VJU. Tuition fee per student for 2-year program (3.300 USD or 75.000.000 VND) is only approximately 20% of actual fee. Additional to special financial aids for all students of VJU, students admitted to VJU master’s programs in 2019 may receive one or more than one scholarships. All of useful information built a wide understanding about VJU privileges which shall be attained if they study here. VJU Open Campus 2019 also had variety of cultural activities for participants.